The Madonna of the Magnificat (Italian: Madonna del Magnificat) is a painting by the Italian Renaissance master Sandro Botticelli, executed in 1481. It is housed in the Uffizi, Florence. The work portrays the Virgin Mary crowned by two angels. The Child Jesus is keeping in a hand the pomegranate, symbol of the Resurrection. 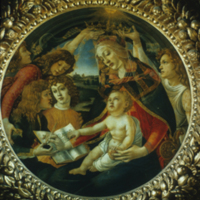 The painting is said to portray the family of Piero de' Medici, lord of Florence from 1464. His wife Lucrezia Tornabuoni as Mary, Lorenzo de' Medici as the young man with the ink-pot, flanked by his brother Giuliano de' Medici who is holding a book. Behind the two boys is Maria, while the two older sisters are holding the crown in the background: Bianca on the left and Nannina on the right. The newborn would be the daughter of Lorenzo, Lucrezia de' Medici. Sandro Botticelli (Italian painter, ca. 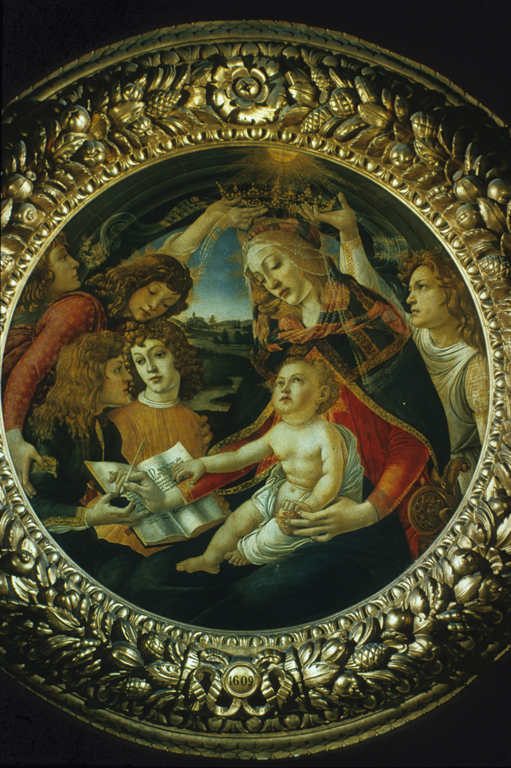 1444-1510), “Magnificat Madonna,” Institute Images Online, accessed April 24, 2019, http://westerncivart.com/items/show/2719.